Web surfers at an internet cafe in Beijing, 2010. The number of Internet users worldwide has reached the two billion mark, the head of the UN's telecommunications agency, Hamadoun Toure, said. The number of Internet users worldwide has mushroomed to reach the two billion mark, the head of the UN's telecommunications agency, Hamadoun Toure, said on Wednesday. The number of mobile phone subscriptions also reached the symbolic threshold of five billion, the secretary general of the UN's International Telecommunications Union (ITU) told journalists. "At the beginning of the year 2000 there were only 500 million mobile subscriptions globally and 250 million Internet users," he said. "By the beginning of this year 2011 those numbers have mushroomed to over five billion mobile users and two billion subscribers to the Internet," Toure added. An ITU statistician told AFP that the figure for mobile telephones related to subscriptions. 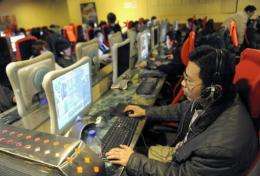 Fresh data posted online by the agency showed that the estimated number of Internet users had reached 2.08 billion by the end of 2010, compared to 1.86 billion a year earlier. The estimated number of cellphone subscriptions worldwide reached 5.28 billion at the end of the last year, compared to 4.66 billion at the end of 2009. "The very high growth in mobile (phones) is slowing and we're reaching the end of double digit growth in mobile," Susan Teltscher, ITU head of market information and statistics, told AFP. With the world's population exceeding 6.8 billion, nearly one person in three surfs online. Fifty-seven percent of the users are in developing countries, three years after the ITU reported that Internet use there overtook developed nations. The number of fixed broadband internet subscriptions in the world passed the half a billion mark for the first time in 2010, reaching 555 million, while the number of mobile broadband subscriptions surged to 940 million. Meanwhile, fixed telephone landlines declined for the fourth year in a row, dropping just below 1.2 billion. Asia and the Pacific spearheaded the shift into cyberspace, adding more than 100 million internet users to the global tally to bring the number of Internet users in the region to 857 million -- largely due to China, Teltscher noted. But the highest density of online surfers in the population is found in Europe, followed by the Americas, former Soviet states and Arab nations, according to the ITU data. The most rapid online growth in recent years has occurred in the latter two regions. In Arab states, the estimated number of Internet users has reached 88 million, doubling in the space of about five years. Growth in Commonwealth of Independent States was even faster: 127 million people used the Internet there last year, compared to 51 million in 2007 according to the ITU estimates. "They have been catching up because they had lower penetration rates before," Teltscher explained.